Preview: Al Jolson visits Murdoch Mysteries | TV, eh? 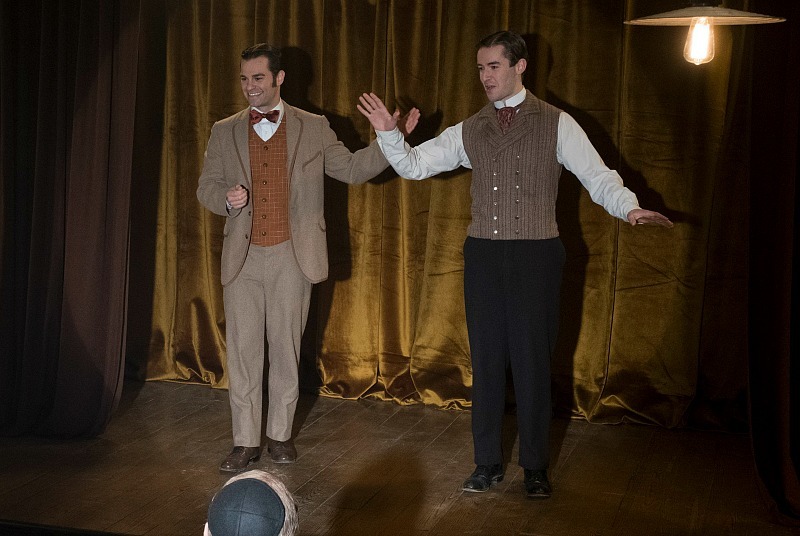 After a three-week break for the Winter Olympics, Murdoch Mysteries roars back onto CBC’s schedule with an interesting and unique episode. Murdoch investigates a murder with connections to vaudeville entertainers Harry and Al Jolson and Watts unravels a mystery about his own family. And, as always, a few more tidbits from me after watching a screener. After several episodes away, John is back in Station House No. 4 where he spends a lot of time alongside Higgins, working the main murder case. And, while working it, someone catches John’s eye. Is yet another romantic relationship in the cards for a Murdoch character? My research—OK, Google—shows Al did indeed perform in Toronto, though not exactly during Murdoch Mysteries‘ timeline. No matter, he and his brother make an immediate impact. Kudos to Sayer Roberts for the great performance as Al, who connects with Detective Watts in a major, and surprising, storyline. Daniel Maslany gets major screen time on Monday night and I couldn’t be happier. Not only is the slightly dishevelled detective on point during the murder investigation, but he and Al Jolson spend numerous scenes together, rounding out Watts in a fascinating way. This is one of the best shows. I can’t stand the reality TV we have these days. I wish the powers that be in the USA would take the hint and have entertainment and not reality garbage. I agree with you a 100%, this is a great show and real entertainment. I watch very little USA TV because most of the programs are so bad. I am also fed-up with the programs in the USA telling me how I should think or live. But the only way I can see these programs is to buy the CDs at the end of the season. Give us a hint on Jilliam pregnancy progress..it’s an agonizing wait! After three weeks Murdoch and all my other favourite shows return next week! I was adding this information to IMDB and Robert Rotenberg doesn’t exist in their database. Strange. What is the title of the episode of Murdoch Mysteries where Al and Harry Jolson are portrayed please, also do you know if this episode will be shown in Victoria, Australia and where or when please and/or whom I may contact for more information please? The episode is called “Murdoch Schmurdoch.” You can read more details in my preview above. As for when this episode will air in Australia, you’ll have to check with your local broadcaster.